You might think the name of this roll is a little weird. Why name it the “Jumpin’ Jackfish Roll”? Well, let me explain. The inclusion of jalapeños and togarashi make the roll more than a little spicy, so it’s definitely “jumpin'”! 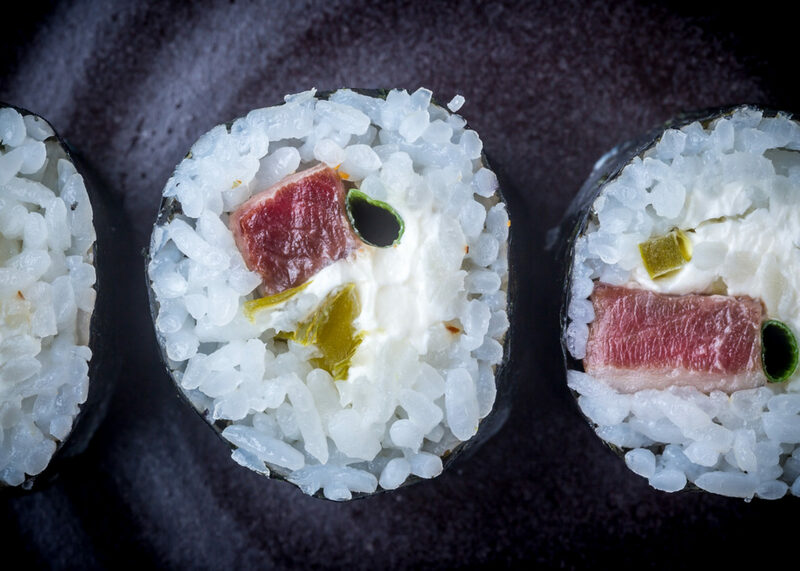 And as I mentioned in my Yellowtail Nigiri post, yellowtail is actually a type of jackfish, so this being called a “Jackfish Roll” actually makes a lot of sense. 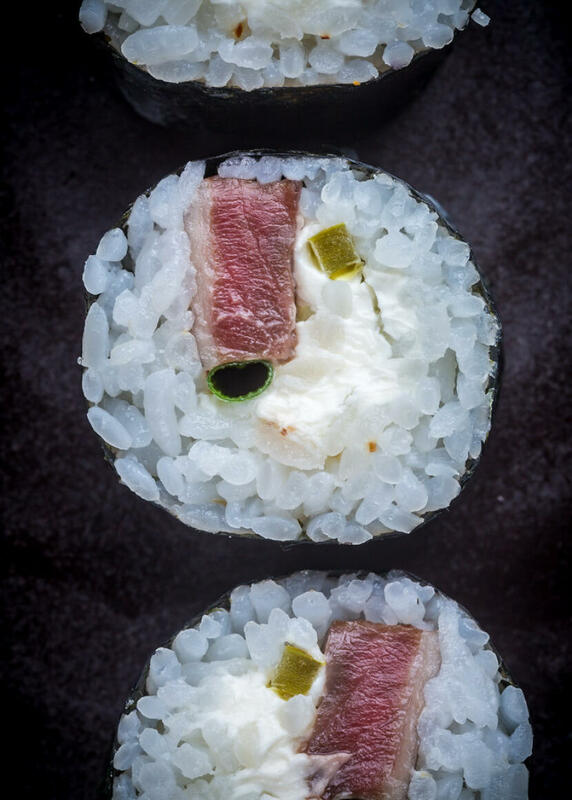 This roll is originally from Tex Wasabi’s, a sushi and BBQ restaurant found in Northern California. Roll the sushi, using yellowtail, cream cheese, jalapeños, a stalk of green onion, and a sprinkle of togarashi as your fillings. I LOVE jalapeÃ±os in sushi. Spicy tuna rolls tempura style with a slice of pickled jalapeÃ±o on top if my favorite sushi. However, I don’t really like the crisp texture of fresh jalapeÃ±os, and pickled ones kind of overpower the taste of a lot of the tunas. Any ideas on how to prep them to blend in more with the fish? You could always eat (or make) it with the Rolling Stones’ Jumping Jack Flash playingin thebackground! Dave – Hmmm. I’ve always used the sliced jalapeños in a jar, so I’ve never really had a problem with them. Plus I don’t really eat them, so… yeah. 😛 Blanching could work, another thing that might work is sauteing them? Slice them up, stick them in a pan with a little butter or oil, and saute them until soft. not sure how well that would work, but I can imagine it working pretty nicely. Joel – Awwww, I feel so special! 😀 It takes a little practice to make the sushi look good (several of my first ones fell apart!) but they certainly are delicious mistakes! My attempts at sushi have always ended in disaster, however when friends from Japan come and stay I let them try to show me. I’m getting better. Nice looking recipe – thanks for providing. I sent it to my sister who likes sushi very much.